Out of stock since Wednesday, 3 April 2019. Due back soon. 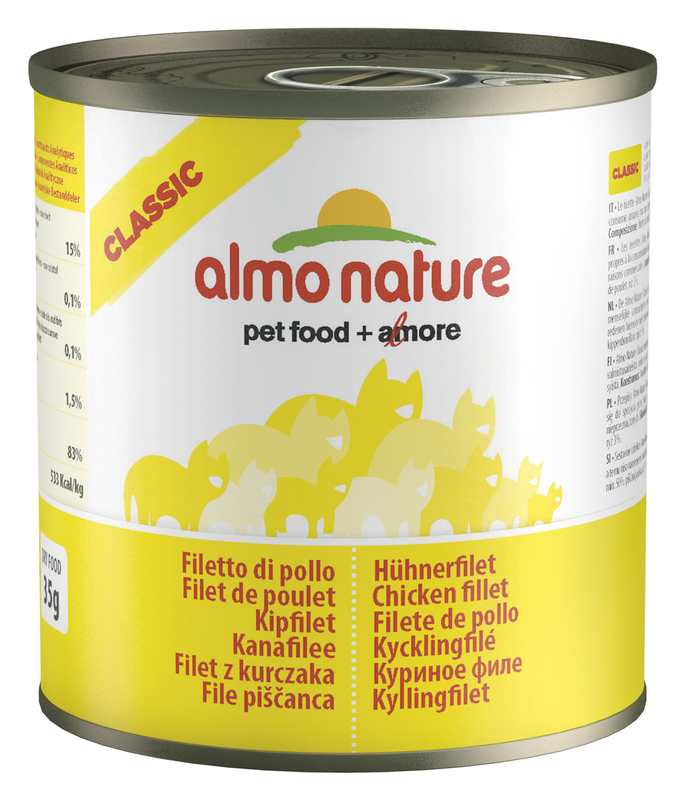 Almo Nature Classic is a range of complementary cat foods made up of white meats, red meats, fish and even vegetables. These ingredients are preserved in their cooking broth with the sole addition of a small percentage of rice. All by-products are absolutely excluded, and so are mineral and vitamin supplements and additives. Now available is the "Chicken Selection" which includes 2 x Chicken Fillet, 2 x Chicken & Whitebait and 2 x Chicken & Shrimp pouches. Chicken 50%, chicken stock 42%, cheese 5%, rice 3%. Chicken 50%, chicken stock 42%, liver 5%, rice 3%. Chicken 50%, chicken stock 40.9%, mango 5%, rice 3%, gelling agent 1%. Chicken 50%, chicken stock 40.9%, pineapple 5%, rice 3%, gelling agent 1%. Chicken min. 38%, chicken stock, salmon min. 12%, rice 3%. Chicken 55%, shrimps 20%, stock 24%, rice 1%. Chicken 55%, chicken stock 24%, shrimp 20%, rice 1%. Chicken 48%, tuna 27%, fish stock 24%, rice 1%. Chicken 70%, chicken stock 24%, pumpkin 5%, rice 1%. Chicken 38%, white bait 12%, cooking water 47%, rice 3%. Chicken breast 55%, chicken stock 42%, rice 3%. Chicken thigh 55%, chicken stock 42%, rice 3%. Chicken fillet 75%, chicken stock 24%, rice 1%. Imperial chicken 55%, chicken broth 40.9%, rice 3%, gelling agents 1.1%. Moisture 76%, protein 19%, fat 1.5%, ash 2%, fibre 1%, energy 672 Kcal/kg. Moisture 80%, protein 13%, fat 1.5%, ash 2%, fibre 0.5%, energy 580 Kcal/kg. Moisture 81%, protein 13%, fat 0.5%, ash 2%, fibre 0.5%, energy 490 Kcal/kg. Moisture 84%, protein 14%, fat 0.2%, ash 2%, fibre 0.1%, energy 472 Kcal/kg. Moisture 78%, raw protein 20%, raw fat 3.5%, raw ash 2%, raw fibre 1%. Moisture 76%, protein 21%, fat 1%, ash 3%, fibre 1%, calories kcal/kg: 820. Moisture 78%, protein 20%, fat 0.5%, ash 2%, fibre 1%. Moisture 82%, crude protein 16%, crude fibres 1%, crude oils and fats 0.5%, crude ash 3%, calories 602 kcal/kg. Raw protein 14%, raw fibre 0.1%, raw oils and fats 0.2%, raw ash 2%, moisture 83%, calories 524 kcal/kg. Moisture 78%, crude protein 20%, crude fibres 1%, crude oils and fats 0.5%, crude ash 2%, calories 742 kcal/kg. Protein 17%, crude fibres 0.1%, crude oils and fats 3%, crude ash 2%, moisture 77%, calories850 kcal/kg. Protein 20%, crude fibres 0.1%, crude oils and fats 0.5%, crude ash 2%, moisture 77%, calories 742 kcal/kg. A healthy, adult cat weighing 4kg requires 110g of wet food and 35g of dry food. Fresh water should always be made available. Food should be served at room temperature and stored in a cool, dry place. There are currently no questions for Almo Nature Tradition Classic Adult Chicken Cat Food - be the first to ask one!